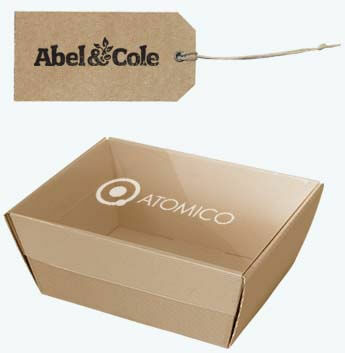 Our branding and personalisation service is the most cost effective way to overprint your logo onto a variety of gift packaging accessories without the large price tag and lead time of going bespoke. Overprint your logo onto a variety of gift tags, acetate lids, card sashes and ribbons, and turn your products into a branded gift. Personalising accessories with your company name or logo is an inexpensive way to dip into the world of branded luxury and strengthen your brand identity. Prices are per unit for over-printing and based on approval of supplied artwork. Prices exclude the unit cost of the items. Print Colours: Our standard print colours are available without an extra charge; black, white, brown, gold and silver. All other colours are charged at £10 per colour. Size Change Charge: £10 charge will occur per change of box size where a variety of different sized boxes are being printed with the same size logo Printing Costs do not count towards discounts or free delivery. Printed ribbon is available in almost any pantone colour of your choice. Silkscreen printing means we apply flat (spot) colours, so colour gradations and drop shadows are difficult to print. Artwork is to be supplied as a Vectored EPS or Adobe Illustrator file with pantone references. Take care when reversing print out of a big block of colour - letters tend to fill in. Be Bold. Simple designs usually have more impact than complicated fussy prints. Colours are printed one after the other and tolerance is 1.2mm so exact registration for one colour with another may not work as well. Request a quote by completing our online quote form. A member of our sales team will respond within 2 hours during our opening times. Our design team will create a visual of what your product will look like with your artwork and send it to you for approval. Once approved, your product will be over-printed and delivered within 10 working days.